The temple is dedicated to Devi Rukmini- wife of Lord Krishna. 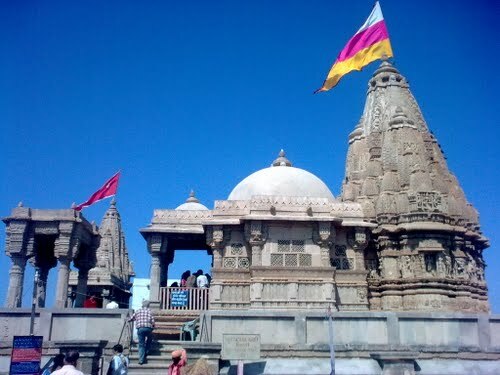 It is about two kilometers from famous Dwarakadheesh temple of Dwaraka. The legend is that one day Sri Durvasa saint came to Dwaraka as a guest to Lord Krishna and Rukmini. He put a demand that he be put on a special chariot and instead of pulled by horses Lord Krishna and Rukmini should pull the chariot to the guest house where his accommodation is arranged. Lord Krishna readily agreed and started pulling the chariot of the Sage along with Devi Rukmini by his own hand. But when the chariot reached the spot where the present Rukmini temple stands Devi Rukmini felt thirsty. So, Lord Krishna brought water from the ground by digging it with his toe. Although Devi Rukmini satisfied her thirst, this annoyed Sage Durvasa who felt insulted as Rukmini drank water before offering it to her guest Durvasa. The angry Sage cursed Devi Rukmini that she will be seperated from her husband Lord Krishna. Hence this temple at a distance of about two kilometers from her husband Dwarkadheesh at Dwaraka. What ever the legend this temple attract devotees in large numbers through out the year. The architecture of the temple is splendid. It is said, the present temple dates back to 12 th century AD.